Talk about a double whammy of marketing genius when you think about: you’ve got your employees carrying these custom printed cooler bags to service events when catering for weddings, bar mitzvahs…. And then you’ve got customers enjoying the security and safety of a cooler bag for something they’ve purchased. When you think about it, it makes sense — most products are just delivered or given on site with paper bags, plastic bags, or other canvas bags that arguably can’t be reused for much other than carrying other stuff. But cooler bags? Instant reusable value. And it promotes your brand. Imagine what a customer thinks when receiving their purchases for catering in a custom printed cooler bag — that’s value, that’s consideration. It shows that you care. Likewise, let’s say you have waitstaff for events. Not only would they be dressed to the hilt, but they’ll bring the goods in the very best merchandise designed to safeguard the product excellence and keep everything well preserved. Customers see this, you know? And they get the impression that you don’t miss a dime or a beat when it comes to catering. It’s that extra push, the extra mile, the going farther than the competition. We’re willing to bet you get the attention of the bride and groom as salads and other perishables get carried by the very best custom printed cooler bags with your brand name written on them. There’s no losing even one piece of perishable, because that’s money to them (or the father of the bride, really). So Where Do You Find These Custom Printed Cooler Bags? Right here. At BRAVA Marketing. That’s right. All you need to do is check out the countless selections we have in designs and styles right here. You then contact us immediately to discuss just how much in bulk you’d like to purchase. We customize the brand on your cooler bags, and they instantly get shipped out. That’s it. So what are you waiting for? Start now! 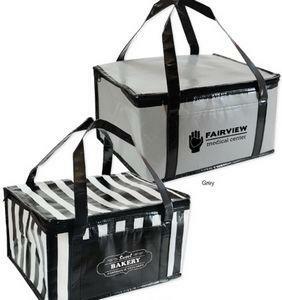 Why Not Market Promotional Cooler Bags With Purchases? You’re focusing on the product and offering an incentive. The great thing about promotional cooler bags is that they not only preserve a customer’s organic food, but promote your brand as well. The name sticks. You stick. You make a strong connection with the customer and give them an added product tied in to what they’ve purchased, and it makes all the difference. Organic food’s good for the soul. Imagine picnics, for instance. Carry your cooler bag, and you’re guaranteed freshness during Spring or Summer while always staying fresh in mind of those customers who bought your products from you — because those products are in that cooler bag you gave them for free! It’s an incentive. An incentive to keep buying. Free gifts for customers go a long way, if it’s the right gift. 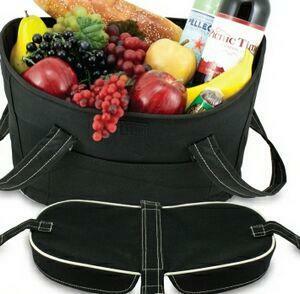 And you can’t go wrong with promotional cooler bags for your particular demographic and niche. For More Information About Promotional Cooler Bags, We Can Help! After all…. What else are they going to do with that free cooler bag? They’re going to buy more of your organic food, of course!